‘Smart’ times ahead for Udaipur – A smart city since centuries! Shriji Arvind Singh Mewar, Chairman and Managing Trustee of the Maharana of Mewar Charitable Foundation, addressing the inaugural session of the Smart City Conclave organized by FICCI, Department of Local Self Government, Government of Rajasthan and Udaipur Municipal Corporation, on May 21, 2016 at Sabhagaar The Durbar Hall, Fateh Prakash Palace, Udaipur. 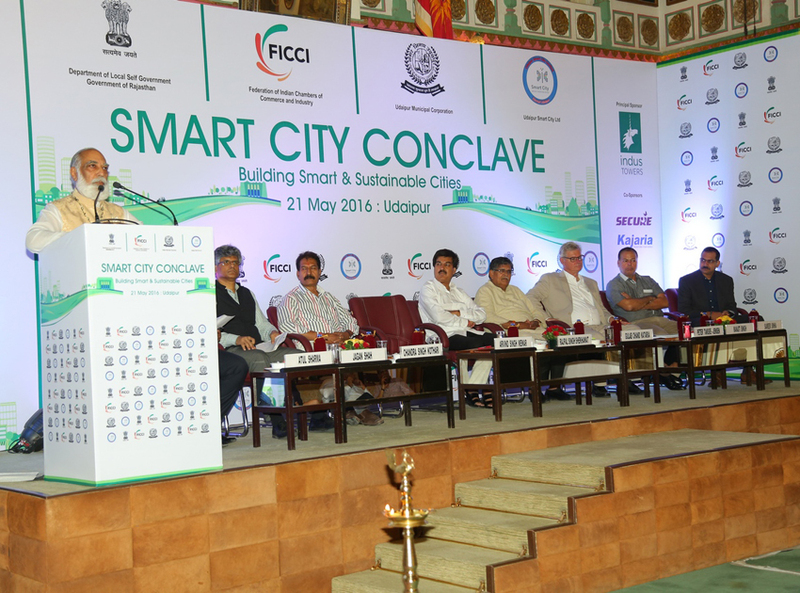 On May 21, 2016 – the auspicious day of BuddhaPoornima – Sabhagaar The Durbar Hall of Fateh Prakash Palace hosted the Smart City Conclave organised by FICCI, Udaipur Municipal Corporation and the Department of Local Self Government, Government of Rajasthan. It was my privilege and pleasure to address the august gathering and I took the opportunity all the stakeholders of Udaipur – the Udaipur Municipal Corporation, the Government of Rajasthan and other local bodies – who ensured that our heritage city was among the first 20 of the 100 Smart Cities announced by the Honourable Prime Minister Shri Narendra Modi. Excerpts from my address: “Please accept my congratulations. We are thankful to the Ministry of Urban Development, Government of India and are proud of making the grade. Prof Jagan Shah, Director, National Institute of Urban Affairs, delivering his address in the inaugural session.